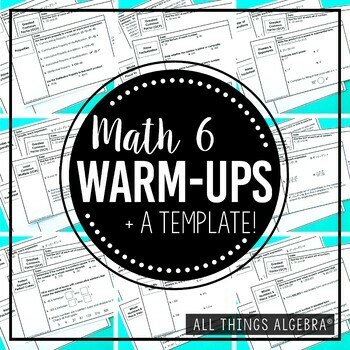 PLEASE READ: This is a growing bundle of warm-ups to be used with my Math 6 Curriculum. Right now, only the first unit of warm-ups are included. I will be adding the warm-ups to this bundle as I write each unit. The warm-ups will be released using the same estimated deadlines as the Math 6 Units. Visit the Math 6 Curriculum page to view this schedule. Be sure to follow me on TpT so you get the email notifications when each new unit is released. 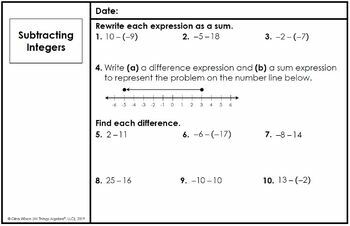 When you see a Math 6 unit has been released, re-download this bundle to get the next set of warm-ups. Upon completion, this bundle will have approximately 100 warm-ups. 1) 14 Warm-Ups (or bell ringers) that are ready to use. They can also be used as entrance/exit tickets. All answer keys included. 3) Warm-Up Template for you to create your own. 4) Smart Board files by unit with the warm-ups already "snipped in". Download the preview for a topic listing of warm-ups currently included. My students typically complete this task while I am taking attendance and returning homework. We go over the answers once they are finished. It's a daily routine that takes roughly 10 minutes. I have found it to be incredibly beneficial for my students. 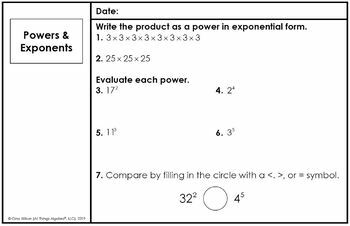 They are in Cornell Note form with topic on left side, and sample problems on the right. Having them already made will be a HUGE time saver!